It’s mid-November and Cyber Monday is just around the corner. It is not only one of the country’s biggest shopping days of the year, but is Alaska Airlines’ biggest fare sale of the year. Forbes reports 40 percent of Americans say they will shop online on Cyber Monday. So what are they shopping for? In advance of this year’s Cyber Monday deals, Alaska’s data analysts crunched the 2015 numbers to figure out what kinds of trips last year’s shoppers were most interested in. 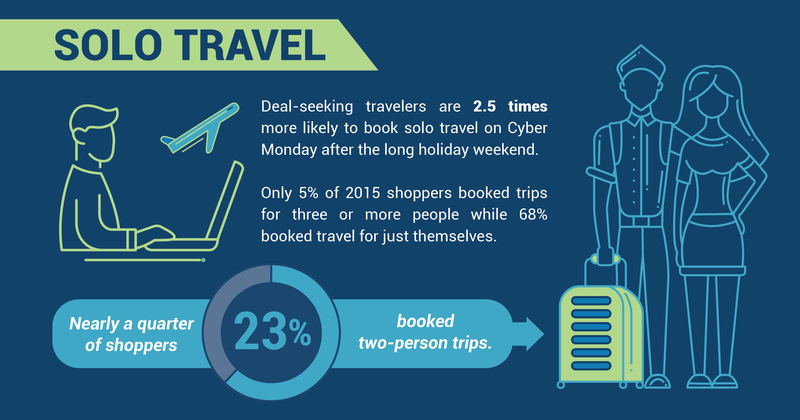 Deal-seeking travelers are 2.5 times more likely to book solo travel on Cyber Monday after the long holiday weekend. Whether they’ve had enough family time or are simply ready to get back to business, only 5 percent of 2015 shoppers booked trips for three or more people while a whopping 68 percent booked travel for just themselves. Nearly a quarter of shoppers (23 percent) booked two-person trips. While the numbers can’t prove motivation, it’s pretty safe to say Cyber Monday shoppers are looking for some peace and quiet after the holiday. A hefty 76 percent of shoppers booked trips without children. Damp weather have you dreaming of a weekend in Las Vegas? Three days in Phoenix? You’re not alone. Last year, 37 percent of Cyber Monday shoppers booked 1-4 day getaways. In 2015, nearly half (48 percent) of Cyber Monday shoppers spent less than 30 minutes shopping before they booked trips, perhaps due to the great deals – Cyber Monday is the airline’s biggest sale of the year, after all. It’s tough to get back to the grind after a long holiday weekend, and the data shows it. A 2013 Retailmenot survey indicated 86 percent of workers planned to shop for deals during work hours. In 2015, shoppers wasted no time getting online on Cyber Monday, with most visits to alaskaair.com between 8-9 a.m., and most bookings made between 10-11 a.m. Can you blame them? Sometimes the dream of a tropical vacation is just the ticket to get you through a chilly November Monday. 2015’s top five destinations for Cyber Monday shoppers were a mix of sunny and not-so-sunny locales. As for 2016’s top destinations – that’s a secret until Cyber Monday. In the meantime, make sure to bookmark alaskaair.com.